Hi, my phone has too long charging time i think, about 4,5hours to 100%, i use original charger and cable. In usb tester i see that charge is 9V 1,68A and it is max. So is about 15watt, in some information on www site i read it should be 24watt. What's problem? Original charger or cable is fault or other? How i can get faster charging? I use oryginal charger 12v 1,5a that come with phone, it charge 9v 1,67a so i think it support pump express but cant switch to 12v on some reason. Charging start from 5v, next switch to 7v, after few seconds switch to 9v and stuck on it. Factory reset is big problem to configure again all phone. I can make this only i have 100% that solve problem or is spossible to make any full backup that can restore if dont work to back all previous settings. 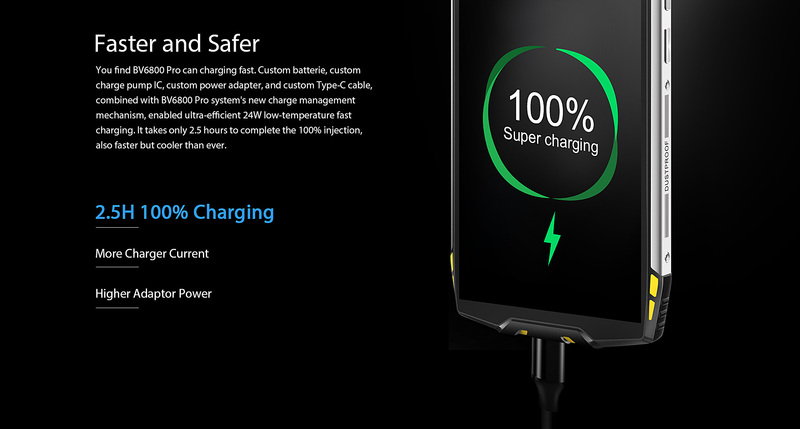 Blackview.hk actually do advertise that phone, charger and cable provides 24w charging. In order to do that, I guess it should charge 12V@2A. My phone 0-100% about 2 hours via charger and cable (50-60% per hour), with wireless adapter about 4-5 hours (10-20% per hour). Just backup your stuff and check for the Google account automatic backup function. Unfortunately a factory reset is always the first step to rule out issues. I also recommend to try another charger which supports the mediatek pump express protocol. I need to know if your original charger is faulty or not. I got original charger with 12V 2A sticker on it. So if it's correct your charger can only charge 18W instead of 24W. Sure, i know it i have 12 * 1,5, this is 18W, so why it charge only 9V? 9*1,67 is only 15W. Where is my 3W on original charger?